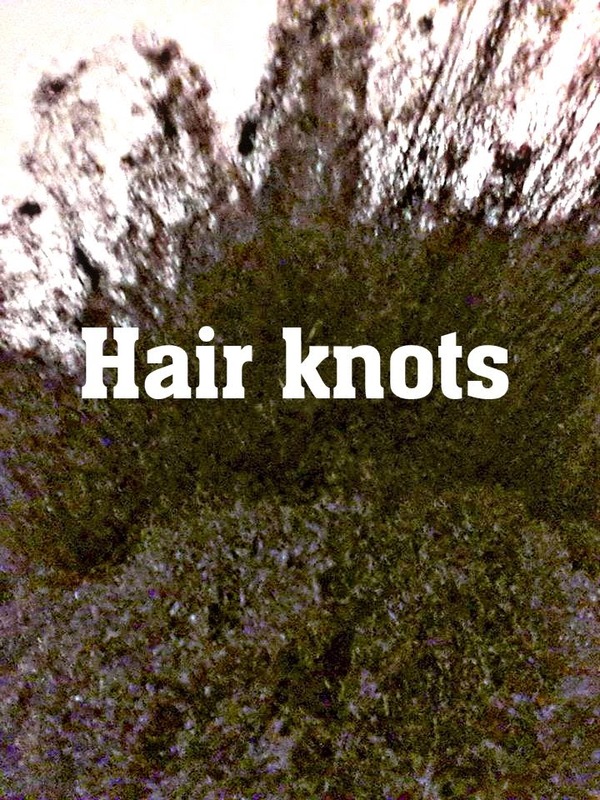 Does your hair form knots no matter what product your try? Do you spend time untangling your hair, only for tangles to reform within minutes upon finishing? Do your ends always feel rough? Are your ends puffy when you braid or twist your hair? 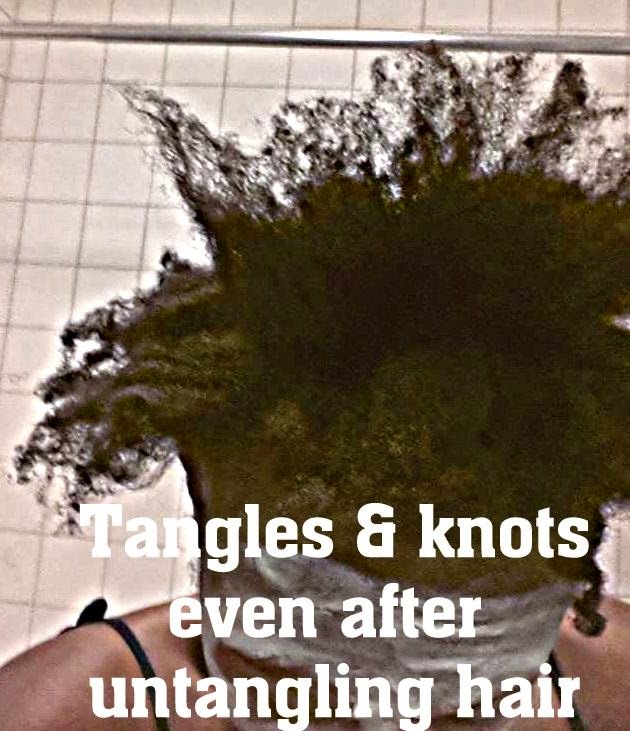 Are you plagued by bothersome single strand knots? If you answered yes to any of these questions this article will help you solve your problem. My hair forms knots if I just look at it. I wash my hair, deep condition it and keep it twisted, but still my hair forms knots when I remove the twists. Even when I press my hair using various methods my ends stay puffy and hard. What is wrong with my hair? Not so fast, trimming your hair may not solve your problem. Before you proceed to cut off unnecessary length, do a test patch. Take a 1/2 of an inch section of your hair and cut it below the frizz line. Cut from the section right by your earlobe on the corners, at the top of the sideburns area. Examine whether the hair still forms knots or puffiness after you have cut below the frizz line. If after your test cut your hair still knots up then you know you suffer from a hair cuticle issue that will not be solved by a trim. What is a hair cuticle issue? Your hair cuticle is the outer layer of your hair, which is made of scales and several layers. The hair cuticle raises and flattens depending upon the weather, products and health of the hair. A healthy hair cuticle opens when it should and flattens when it should. When the hair cuticle becomes unhealthy it stays open, this is called a raised hair cuticle or highly porous. You do not want your hair cuticle to stay raised because it loses moisture quickly. A raise hair cuticle is also frizzy, tangled and full of knots. If the damage is not deep into the hair cuticle layers, it can be corrected. Using the right PH balanced solution will help the hair cuticle to lay flat and hold moisture. The better hydrated your hair is the less tangles and single strand knots you will have. Applying a simple apple cider organic vinegar rinse over your hair, after you rinse out your deep conditioner, will correct a raised cuticle issue. Step one: Do a trim patch test as listed above. If your hair still forms knots then proceed to step two. If the cut patch test shows your hair no longer knotting then proceed with giving your entire head a good trim or visit your stylist for a trim. Step two: Wash your hair with one of the following: a non sulfate shampoo, conditioning cleanser or mud wash. Deep condition your hair using heat by sitting under the dryer. Rinse the deep conditioner out with cold water. Leave on for 3 minutes, then rinse out with cool water. While hair is still soaking wet, apply your leave in conditioner and style. You should see a good reduction in knots and puffy ends. If you somehow do not then wait at least 3 days. But this time you can try the ACV treat. After you rinse out your deep conditioner, while hair is still soaking wet pour the ACV treat mix over your hair, saturating all of your hair and scalp. While hair still has the ACV treat in it, apply your leave in conditioner. Blot with a towel and proceed with your styling. When doing the ACV treat, if you are using a creamy leave in conditioner that masque the scent of the apple cider vinegar. You will also notice that it takes your hair a really long time to dry when doing the ACV treat. Keep that in mind when styling. You should only have to do the ACV treat once. Then you can continue to do the ACV rinse once a week or once a month. AVOCADO OIL is the best for frizzy ends. Smooth over strands after you apply your leave in conditioner and styler. Purchase pure, virgin, unrefined avocado oil. This is the best and what I use. The apple cider vinegar will make the hair cuticle lay flat therefore keeping your hair from forming knots. You should notice an immediate significant reduction in tangles and knots. In most cases the ACV rinse eliminates all knots. You can repeat the ACV rinse again in 3 days. For even better results complete the 18 day hydration & lubrication regimen for excessive tangles. If the ACV rinse does not correct your puffy ends or knots issue, then proceed with the 18 day hydration & lubrication regimen. If your hair is still forming knots and puffy ends, then you could have some deep hair cuticle damage. You can learn to work with it or do a big chop and start over. Won't the acv smell if left in your hair? Also, when I'm going to do an acv rinse after deep conditioning, do I rinse both the deep conditioner and the acv out with cold water or just when I'm rising the acv? Great post my daughters hairs have all these issues listed. How often should I do the regimen after the first wash?